Or if you prefer not to spend the weekend in the pub and would rather stroll around the lovely Wirral coast there is a very nice new gallery and crafts shop on Banks Road in West Kirby called Staacks with a new exhibition by Hoylake-based but Spanish-born Xitina Ferrés. Definitely a Mediterranean feel to the watercolour and thin acrylic paintings. On some the stripes are quite tight and neat whilst others are far more loose, the paint has spread to form tree-like shapes. There is a fine selection of other original art and crafts on sale, including several one-off handcrafted items, some by local artists but many from other parts of the UK. 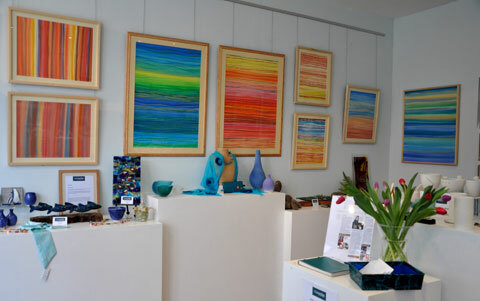 It’s a lovely bright and well designed gallery. Well worth a visit. ‘Colour Collection’ by Xitina Ferrés. 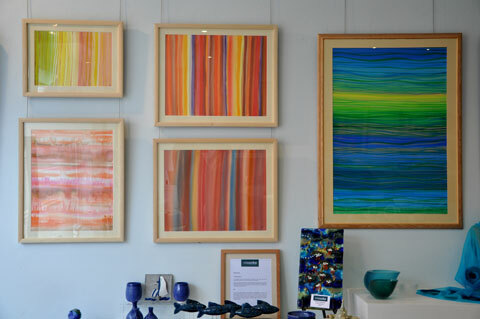 The paintings reflect the strong influence of light and colour from quite diverse landscapes, including Wirral and the Costa Brava in her native Spain.